It must be stressed that Lang’s cinema has not declined over the years. The same objections can be directed at both Metropolis and Moonfleet, and yet both share the same bleak view of the universe where man grapples with his personal destiny, and inevitably loses. Moonfleet, Fritz Lang’s third last Hollywood film, has always been difficult to place and analyse. It is an economical, visually opulent (though still characteristically minimalist at times), and, intermittently, dramatically engaging work that is both very much a Lang film and somewhat to the side of his dominant thematic and visual preoccupations. Although it has long since been reclaimed by English-language criticism, at least that which matters, sustained or even passing discussion of the film has been severely limited. For example, the quotation from Sarris cited above indicates that he sees Lang’s work as an organic whole, with many of the key elements and preoccupations remaining consistent across Lang’s 45-year career. But Sarris’ limited reading of Moonfleet only partly accounts for the film – is it really so bleak a view of the universe? – and tries too hard to relate it directly to a very different earlier film. As I will go on to discuss, Moonfleet is a significant work within Lang’s career but needs to also be placed within the immediate context of its production and critical reception. On its release in June 1955, Moonfleet garnered respectable but largely disinterested reviews, with many critics seeing it as a pictorially striking but minor work within Lang’s declining oeuvre. Some British reviewers, such as Gavin Lambert and Peter Barnes, certainly saw more in the film, and were able to place it meaningfully within Lang’s career, but were still largely disappointed by it, some aspects of its narrative and specific characterisations in particular (3). The film’s subsequently higher critical reputation was largely forged as a result of its 1960 French release, when it was immediately championed as a central film in the Lang canon, prompting Jean-Luc Godard to place it on his list of best films of the year and to subsequently inspire feverish dedications by such key writers as Luc Moullet (4). The fact that the film is only currently available on DVD in France – with detailed audio-visual analyses by contemporary critics Alain Bergala and Bernard Eisenschitz – indicates the substantively higher reputation the film still has in France than elsewhere in the world. Even for many contemporary writers on Lang, Moonfleet is not a key work in the director’s career or even of the somewhat impoverished adventure/swashbuckler genre to which it belongs. The reasons for this geographic disparity are both complex and straightforward, but mostly relate to the dominant readings of Lang’s career at particular times and in particular places. The film’s 1960 French release rode on the coat-tails of the critical high generated by the flush of auteurist criticism then dominant, and its favouring and foregrounding of such elements as mise en scène, Hollywood cinema, and the pictorial dimensions and uses of the CinemaScope frame. It is also possibly true that the film’s rather pedestrian script, loosely based on an engaging and colourful but sub-Dickensian late 19th century novel by J. Meade Falkner, and bare-bones narrative was less immediately evident to non-English language film critics. Moonfleet, after all, is still most striking and illuminating as a visual experience. I think the key “difficulties” of Moonfleet’s reception ultimately lie within its genre, the studio for which it was made, and the place it sits within Lang’s career. Lotte Eisner, in her extended but largely less-than-illuminating discussion of the film, does nevertheless note a shift in Lang’s own opinion of Moonfleet in the 1970s. In other earlier interviews with figures such as Peter Bogdanovich, Lang dismissed Moonfleet for such reasons as the inherent limitations of CinemaScope (he, of course, famously quipped that it was only fit for filming “snakes and funerals” in Godard’s Le Mépris/Contempt ), his difficulties with various actors (particularly Stewart Granger), his unwise willingness to work for MGM again almost 20 years after making Fury (1936), and the interference of the studio (and producer John Houseman, in particular) in the final cut and form of the film. 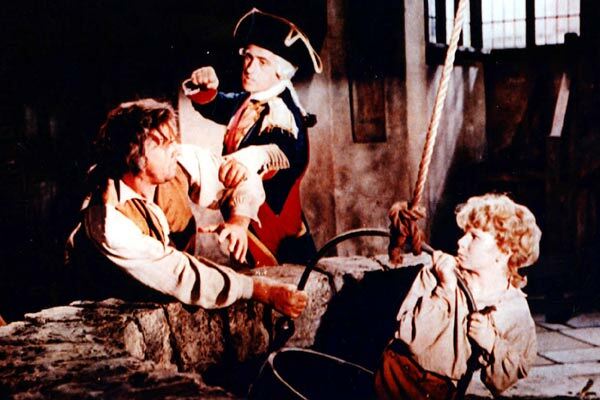 Lang was particularly bitter about its final moments, which he felt undermined the more poetic qualities of the penultimate scene which sees the central adult character, smuggler and gentleman, Jeremy Fox (Stewart Granger), sail out to his death. The subsequent scene, which resolves various questions raised by the narrative in terms of property rights and the true parentage of the young protagonist, John Mohune (Jon Whiteley), was initially regarded by Lang as ideologically suspect and far too prosaic, proprietorial and optimistic. But by the time of Eisner’s interview his opinion of the film had changed; largely, I think, as a result of the high critical reputation the film had developed in Europe (and Lang was plainly very aware of his critical status and the various ways in which his oeuvre had been configured). Nevertheless, Lang’s changed view of the film, and of this “tacked on” ending in particular, is also revealing in light of broader understandings of Lang’s work. It has by now become almost cliché to discuss the dialectical nature of Lang’s work, and the common movement staged in his films between the twin impulses of order and chaos. Thus, despite the often-nightmarish quality of Lang’s films – particularly the films noir of his American career – they are also studies of order and systems (physical, topographical and moral) that are often geometrical in structure. In this interpretative context, the economical neatness of the film’s ending adds a sense of symmetry to proceedings. Although it is considerably more ornate and “filled in” than Beyond a Reasonable Doubt, Moonfleet still has a striking economy. The ‘Scope frame is substantially more luxurious than the boxed in compositions of Lang’s noirs, but one never really gets the sense of the film opening out into a real world. The expansive and beautifully designed sets which constitute the village of Moonfleet and its surrounds still feel restrictive, a dream space dominated by particular motifs, objects and the artifice of their manicured windsweptness. As in other Lang films, the images that tend to most stay with you have a geometrical or architectural quality. This is even true of the design of character and costume and the way these figures are placed within the frame. Lang and his cinematographer, Robert Planck, who had worked on numerous MGM colour musicals, use the ‘Scope frame to highlight the horizontal aspects of composition and the way images are bounded. The narrative itself also has a curiously “diagrammatic” quality. Although the film can, at times, seem leisurely it is pretty much shorn of any excess. This is why many commentators at the time negatively commented upon what they regarded as ellipses in the film’s storytelling. These are the same qualities that now help us recognise the closed in and essentialist nature of Lang’s cinema. As Tom Gunning has suggested, Lang’s films in this mode are quite explicitly “unreal”, with the director insisting “on the constructedness and artificiality of his archetypal fantasy worlds”, and trying not “to endow them either with emotional immediacy or even believability” (6). More than those of just about any other director, Lang’s films are palpably pictorial, and seemingly emerge less from the kind of pro-filmic reality that is routinely captured by the camera than drawn or painted onto the screen. This is partly why many of Lang’s films seem to have a comic book-like quality about them, with characters composed almost as still postures within the frame rather than living and breathing entities (or bodies). This quality is, of course, also clearly related to popular conceptions of Lang as a disciplinarian and model of directorial control; very few of the actors he worked with on Moonfleet had much that was very positive to say about him (though the feeling was seemingly mutual). For example, Viveca Lindfors stated that he treated his actors like cattle, his stylised direction of them constituting little more than actual “directions” about where to stand and how to move (7). Lang’s direction and design of Moonfleet is also more self-consciously theatrical than for many of his other American films. This quality was accentuated by Lang’s approach to staging within the unfamiliar dimensions of the ‘Scope frame: “I plan to light my principals just as you would in a play, dropping shadows on the sides of the stage to concentrate on the main action and the players involved in it” (8). These elements go hand-in-hand with Lang’s almost mathematical or geometrical approach to staging and structure. These aspects of Lang’s cinema are immediately visible upon watching the film, but also constantly underline day-to-day aspects of the filmmaking process: his shooting-script for Moonfleet is full of diagrams and geometric maps of how to break-down the action and where to place objects and actors (9). This is a key reason why Lang’s films are dominated by particular motifs like circles (the narrative and form of the films also often rely upon such circularity) and thresholds (which feature heavily in Moonfleet) and have, within the context of classical narrative cinema, an almost abstract quality. One of the main reasons why critics focus upon issues of fate and predestination in Lang’s cinema is because of Lang’s orchestration and predigestion of the material. Lang’s is almost the opposite of an organic cinema, but this aesthetic proceeds from and is totally integrated into his formal, materialist and thus modernist approach to filmmaking. Thus, despite the fact Lang had very little time to prepare for the filming of Moonfleet – although the script had been written two years earlier he only had about two weeks to prepare the production before filming started – his control and shaping of the material, and the materiality of the film, is evident throughout. Nevertheless, although many specific compositions in Moonfleet self-consciously present the image and action as if on stage (or viewed through a frame), they rarely have the look of a diorama (as do many of the shots in the Indian films) Ultimately, Moonfleet is most fascinating for the ways in which it negotiates the space between competing directorial and studio styles. Moonfleet is definitely one of the most visually striking films of Lang’s American career, and more satisfying than a number of other more characteristic entries in his filmography. But I don’t think the film quite deserves the reputation it has forged in France, and is definitely a notch below the best films of Lang’s American sojourn: You Only Live Once (1937), You and Me (1938), Man Hunt (1941), Scarlet Street (1945), Rancho Notorious (1951) and The Big Heat (1953). As I have discussed, Moonfleet’s mixed reputation is caught up with the auteurist reappraisal of Lang’s work. The film definitely has something of the tone and sensibility of Lang’s bleaker American work but it still feels more like an escape, less to the wilds of Dorset in the 1750s than the sound stages of MGM 200 years later. It is equally fascinating in terms of how it stages a kind of battle between studio, director, genre and star (as the film is equally recognisable as a Stewart Granger swashbuckler – though the “swash” is a little muted). Moonfleet is also something of a holiday from the relentless modernity of much of Lang’s previous and subsequent work. It ultimately should be placed alongside such a highly enjoyable western as Western Union (1941), one-shot experiments like the vastly underrated You and Me, and the Indian films, works which help provide a more complex and varied picture of Lang’s cinema after his initial flush of success in Germany. This title is taken from Jonathan Rosenbaum’s comments on Lang’s late films cited by Tom Gunning in The Films of Fritz Lang: Allegories of Vision and Modernity, BFI, London, p. 392. Andrew Sarris, The American Cinema: Directors and Directions, 1929-1968, Da Capo Press, New York, 1996, p. 64. See Gavin Lambert, “Moonfleet”, Monthly Film Bulletin vol. 22, no. 258, July 1955, p. 102; Peter Barnes, “Moonfleet”, Films and Filming vol. 1, no. 11, August 1955, p. 17. Luc Moullet cited in Lotte H. Eisner, Fritz Lang, Da Capo Press, New York, 1976, p. 345. Jacques Rivette, “The Hand”, Rivette: Texts and Interviews, ed. Jonathan Rosenbaum, BFI, London, 1977, p. 65. Lindfors quoted in Patrick McGilligan, Fritz Lang: The Nature of the Beast, Faber and Faber, London, p. 412. Paul M. Jensen, The Cinema of Fritz Lang, A. S. Barnes, New York, 1969, p. 190. See Bernard Eisenschitz’s short documentary, Fritz Lang’s Messages (2001), included as an extra on the French DVD release of Moonfleet.